A man is going viral for taking a knee on the football field and it’s not for the reason you might think. The high school football coach in Georgia was struck by cupid’s arrow and enlisted the help of his team to propose to his longtime love,. 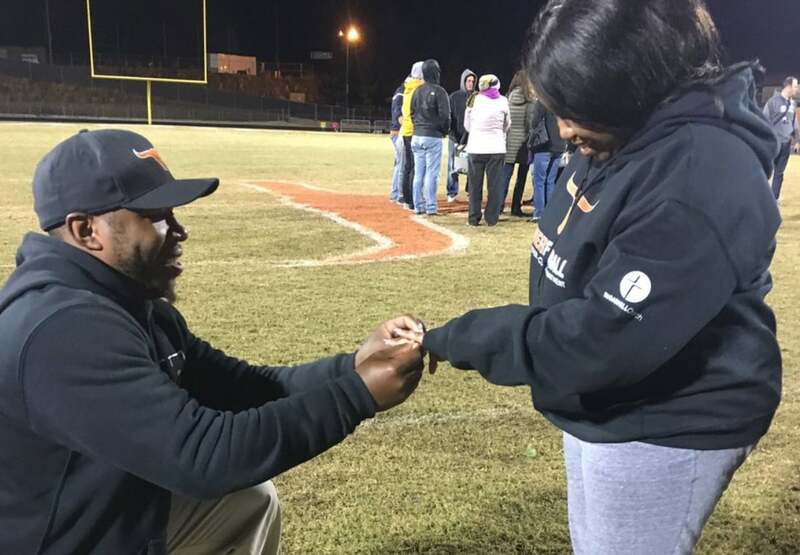 Nafis Pickett who coaches for Lanier High School Football in Sugar Hill, Georgia went viral on Twitter this week when a video surfaced showing him asking his girlfriend Ashley Wilson for her hand in marriage as the football players handed her red roses, ABCr eports. The super sweet proposal captured everyone’s hearts on social media as they watched the coach serenaded his girlfriend with words of love and praise. Pickett’s proposal may have outdone the basketball proposal that went viral earlier this year. This video of a couple took our breath away when a boyfriend surprised his girlfriend with a proposal on center court at a Philadelphia 76ers game. The couple apparently were shooting hoops, probably during halftime when most NBA games infuse audience activities into the game schedule. First the boyfriend took shots and then he tagged in his unsuspecting girlfriend so she could give it a go. The host was encouraging the woman as she was missing shots left and right. But he told her to keep trying because she had time on the clock. Then when the woman finishing taking her shots, she turned around and to her surprise her beau was on bended knee with a ring. He put a ring on it and she said yes! The crowd went wild as the commentator instigated the ordeal, screaming, “Yes” and getting the crowd riled up. The woman looks like she was ready to faint and was definitely shocked and surprised. We’re not sure who the couple is, but we want an invite to the wedding to see how all this pans out! Congrats to all the cute couples!